Wood Badge is leadership training for all Scout Leaders who are involved in the programs of the Boy Scouts of America – Cub Scouting, Boy Scouting, Varsity Scouting, and Venturing, as well as council and district leaders, and professionals. This training program focuses on leadership and “people” skills. You will learn techniques to make you a better leader, and also how to lead groups to achieve objectives. The 21st Century Wood Badge incorporates the best of nearly a century of Scouting experience in addition to drawing upon the most current leadership models used by corporate America, academic circles, and successful outdoor leadership organizations throughout the country. Skills developed from Wood Badge training will help you as a leader in Scouting and all other areas of your life as well. There are two parts in the Wood Badge program: The Practical and the Application. Both must be completed before final recognition is given. The Practical phase is either a six-day or two-weekend experience. You will take part in numerous presentations, discussions, and activities that explore and advance a wide range of leadership philosophies and tools while living in a Scouting environment. This will motivate and enable you to do the best possible job in your home Scouting role. 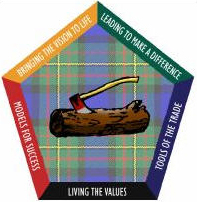 One of the great traditions of Wood Badge is the “ticket.” During the course each participant will be asked to develop a contract or ticket – a list of goals that will allow them to use their newly-learned leadership skills in ways to strengthen Scouting in their home units, districts and councils. The ticket will include the participant’s personal values, roles in Scouting, vision of success, and a mission of five significant goals that can be attained within 18 months. Overall the ticket will be meaningful and enable the participant to practice the skills learned in the course. Troop Guides (Ticket Counselors) will assist participants in writing their tickets and approve them when complete. The Troop Guide and the participant will mutually agree when all the items of the ticket have been fulfilled. Recognition for the successful completion of Wood Badge (including the ticket) consists of the distinctive Wood Badge neckerchief, woggle, the Wood Badge – two wooden beads worn on a leather thong around the neck, and the certificate. This “Regalia” is recognized around the world as a symbol training and leadership experience. If you previously completed a Wood Badge course, agree not to wear your regalia. Have completed the basic training courses for their Scouting positions. Be capable of functioning safely in an outdoor environment. Successful completion of the BSA Class 3 Physical is required for all participants.